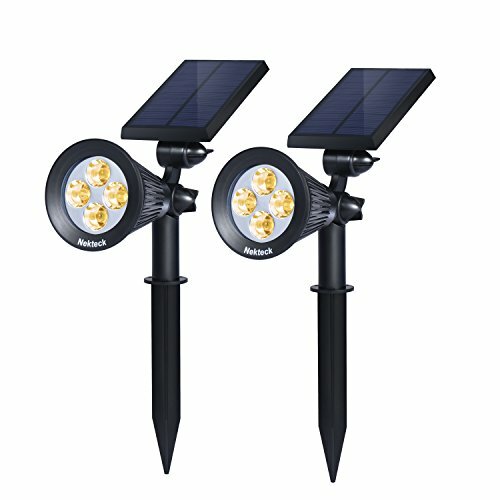 Choosing the Best Solar Landscape Lights? Solar landscape lights are an exciting and beautiful addition to any landscaping design. They serve the dual purpose of illuminating your pathways and driveways while adding style and romance to your outdoors. Check out our recommendations below and perhaps you’ll find an option that you like. These chic lights from Ohuhu come as a set of six and they’re made from sturdy stainless steel, which means they’re weather resistant and definitely long-lasting. In keeping with the latest trends, they’ve got a nice and sleek copper finish, with a design that fully integrates the poly-silicon solar panel into the snug lid. They emit an ambient white light that’s bright enough to illuminate your pathways while being soft enough to emit a charming ambiance when highlighting your foliage. With a 1 ft. lighting range and lighting capacity of 6 to 8 hours per charge for each light, these are really good value for money. Plus, they come with a timer function which enables them to turn on automatically when the sun sets and switch off at the crack of dawn. 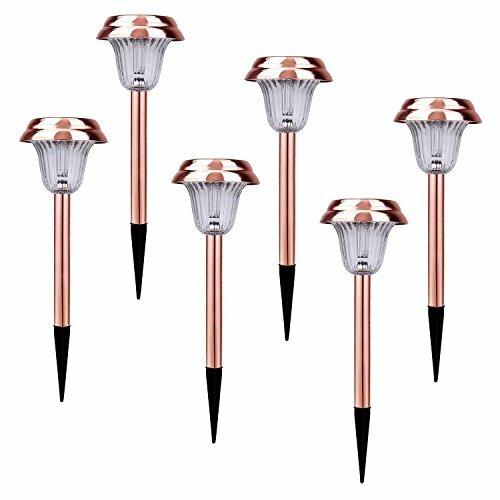 These lights are available in two color choices; copper or silver, and they come with a set of nine stakes and ground spikes, as well as rechargeable batteries. Ohuhu backs these lights up with a 30-day money-back guarantee. With a lighting capacity of 12 hours per charge and 50,000 overall per light, these four wireless lights from URPOWER offer a brilliant white light that’s ideal for illuminating a large area. They feature infrared technology, motion sensors, a massive solar panel and a lifespan of up to 5 years. Not only do these lights switch on and off automatically and according to your preferred settings, but the motion sensor technology enables them to switch on whenever they detect movement that’s at 10 feet away. The sensor switches off automatically after 10 seconds while the light does so 30 seconds after the movement stops. Not only do they switch on and off automatically as well but they also come in two light modes including dim light and high light. To benefit the most from these solar lights and their motion-sensing abilities, make sure that they’re facing south when you install them. That way, they’ll be positioned to get full sun exposure, and you have to fully charge the batteries before you start using them. These six SolarGlow lights are as durable as they are stylish. They’re made from a combination of rugged and waterproof ABS plastic as well as weather-proof stainless steel. They come with their own solar panel attached to the lid and their lighting power is 15 lumen which means that the light is bright but not too harsh. For the best results with these lights, make sure you leave them in contact with the sun during the day so that they can shine bright at night. These are easy to install as they’re completely wireless and have an easily accessible switch so that they don’t waste energy when not in use or stored away. Plus, they come with a lifetime replacement guarantee. These amazing lights come with an impressive power output of 200 Lumens, which makes them an ideal option to illuminate your garden throughout the seasons. They also work great for lighting driveways and their brightness can last for up to 10 hours per charge. Neckteck designed these lights to have a variety of settings. You can choose between multi-colored party lights for when you’re entertaining or go for a ‘white light’ ambiance on normal days. Not only are they suitable to mount on the wall, but they come with the necessary equipment to place them in the ground as well, should you wish to do so. Inside the tough-wearing reflective plastic casing of each light is an extra-large solar panel to absorb as much light as possible during the day so that they can last for longer when it’s dark. Neckteck gives you even more options with the ability to adjust these to 180 degrees if you like, and there’s a dim light mode and a bright light mode as well. When you first get the lights, you’ll notice that they’re covered with a layer of protective film. You’ll have to remove this film and place the lights in a really sunny spot for the initial charge before you use them. Just keep in mind when you purchase the lights that they may not work as well in rainy conditions when there’s no sun exposure. 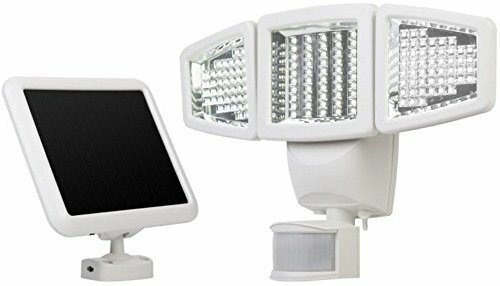 This LED solar spotlight is just what you need if you’re looking for something to brighten up your porch, balcony or walkway. They’re made from a sturdy plastic frame with a nice matte black finish and a spotlight that you can rely on no matter what the weather’s like. It also comes with a built-in solar panel accompanied by 4 LED light bulbs that emit a brilliant white light with a power output of 200 Lumens. A complete charge gets you 9 hours of light, while the maximum light capacity of this product is 50,000 hours. You can mount it on a fence or wall for full coverage or stick it into the ground with a spike, and it’s fully adjustable so that you can point it towards the sun no matter where it may be in relation to the spotlight. Hoont also added features like an “automatic on-and-off” button that enables the light to preserve energy by switching off when not in use. This light is ideal for renters because it’s very easy to install and move around. This hanging solar light lantern from SolarDuke is truly special. It has a soft light that adds a special charm and warm ambiance when you hang it up. It looks perfect when hung on a tree branch or in your entryway, and even when placed on the ground to illuminate a pathway. 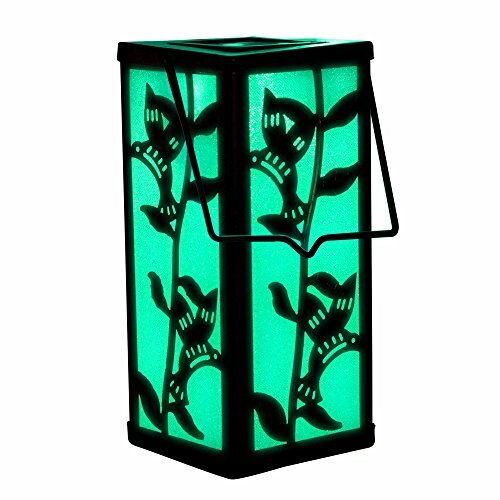 Standing at 8.6 inches tall, the light emanating from this lantern spans for a couple of feet ahead and it’s made from a strong metal frame that’s weatherproof and resistant to corrosion. It comes with two light settings; clear light which delivers normal bright white light and flash mode which delivers a kaleidoscope of LED light colors. Thanks to its amazing features, this light makes for a great gift idea for friends and family. This solar light features advanced motion-sensor technology and adjustable heads which allow you to direct the light as you wish. Plus, each head has 150 LEDs that have a power capacity of 787.5 lumens- great for lighting your driveway, pathways, entryways and your outdoor pool. In fact, the light emanating from this light is so bright that you’ll be able to clearly make out the details of anything that stands in front of it! 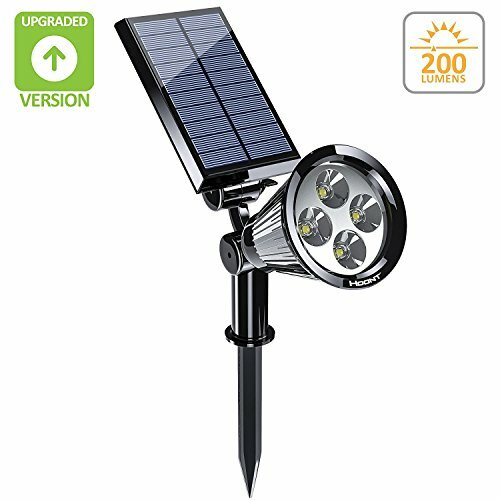 Other features of this solar light include an automatic on and off switch, flexible controls which you can use to determine how long you want the light to stay on and when, as well as an adjustable base that will allow you to place it comfortably on a flat surface as on a slanted one. If you’re looking for a light that’s stylish, elegant and powerful, then this Victorian-style lamppost solar light from Gama Sonic is definitely worth considering. It’s constructed from rust-resistant cast-aluminum and features a matte black powder finish, with dual lamp heads that boast powerful 200 lumen bulbs. The solar panel is made from monocrystalline silicon, with a weather-resistant tempered glass frame on top to keep it protected. Not only is this light rust resistant but it’s incredibly simple to install, requiring only that you attach the post to a solid surface using the bolts which are included in the package. Once you switch this light on, it imparts a very soft light that’s not too bright, and you can even adjust it by simply choosing either the high or low brightness mode. The only thing better than a normal landscape light is one that’s powered by the sun! 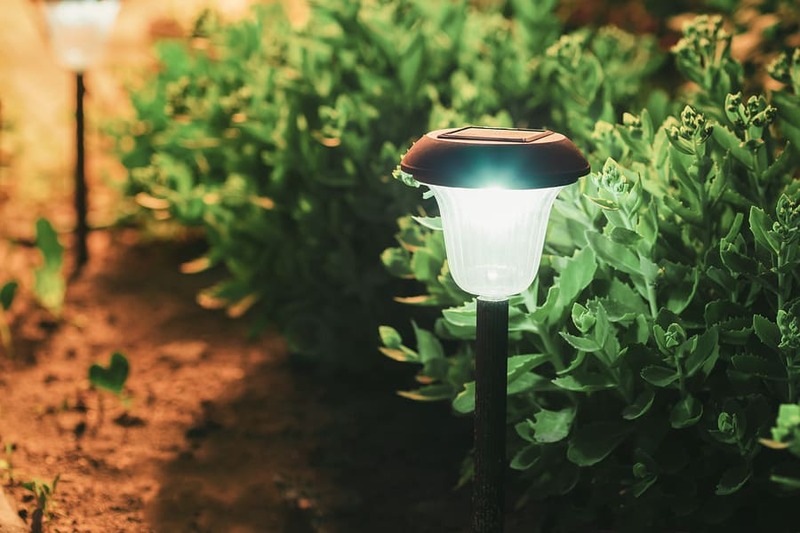 Not only will using solar-powered landscape lights help to reduce your electricity bill, but they’re usually super easy to install and maintain, and are available in a wide variety of designs. If we were to recommend one option from the ones featured above, it would have to be theOhuhu set of six lights that are made from weather-resistant stainless steel. What makes these lights so awesome is that they’re built tough and have a stylish modern design with copper finishes. They also have a high power capacity and can provide up to 8 hours of light with just one charge. We’d definitely recommend the Ohuhu range for anyone that wants to illuminate small to medium sized spaces, and they look great when you’re hanging outside. Landscape lights are a beautiful addition to any outdoor area. Not only do they light the way for you and your guests to easily make your way around outside when you’re entertaining, but they also have a way of creating a special ambiance. They also illuminate your driveway and pathways so that it’s safer for you to move around at night, while clearly demarcating the space. However, you need to find the right lights in order to experience all of these wonderful benefits. Read on to find out how. One of the key things to keep in mind once you’ve decided to purchase landscape lights is to make sure that their style and quality match your preferences. Of course, there are certain standard features that all landscape lights should have regardless of design, and it’s these non-negotiable qualities that we’re going to help you learn more about below. 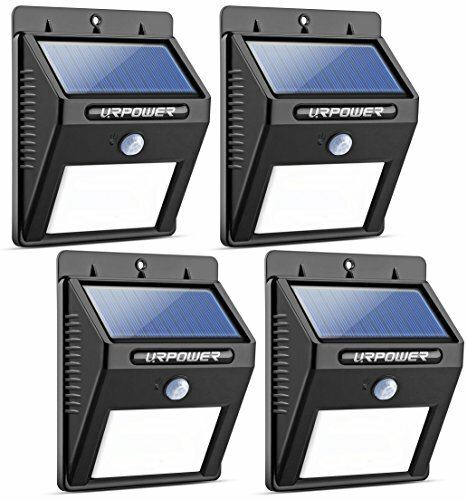 One of the good things about solar pathway lights is that they’re available in a wide range of different quantities. Obviously, you want enough lights to cover the entire space that you’re purchasing them for, while also keeping in mind that their quantity will influence the final price as well. You can figure out how many lights you need by dividing the total cost by the number of lights in the pack. If you’re thinking of buying wired lights, make sure that they stretch far enough to cover the entire surface area that you need them for. The material that your lights are made of will affect their performance and lifespan. For example, plastic lights are too fragile to last through harsh winters and summers but they’re very affordable. On the other hand, aluminum and stainless steel lights can easily handle extreme weather conditions, but they do come at a higher price point. As you’re shopping for your solar lights, you’ll find that some models are easier to set up and install than others based on their design. For example, there are wireless models that can draw power from the sun independently, while other types of lights need to be connected to a solar panel using the right wiring. Wireless lights are obviously much more convenient and you can place them pretty much anywhere, while lights that require wiring will have to be placed relatively close to the solar panel which will be their power source. You also have to consider how the lights are designed at the base as this will affect the installation as well. 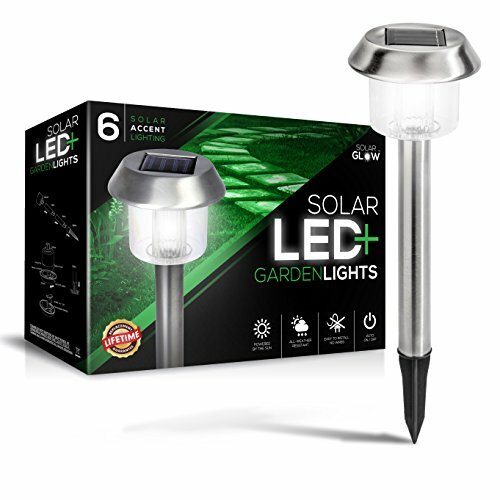 Generally, solar lights feature a stake or a spike that makes it easy to place the light into the ground where it should be able to stay in place throughout the seasons. The intensity of the light that you need will depend on what you’ll be using it for. If you’re purchasing the lights to illuminate a path or a certain outdoor area, then you’ll have to get super bright lights that will be able to illuminate the entire area. However, some people actually prefer slightly dim lights, as they’re purchasing them just to create a relaxed ambiance when hanging outside and not necessarily to illuminate the place. So, look for a light that has the appropriate lumens output for your specific purpose. Again, you should get lights that are of the right size for the specific area that you’re buying them for. The overall size of the light is usually reflected in the product description and is measured from the top of the light to the bottom of the stake or spike. You also have to think about the length of the ground spike as well so you can get an idea of what the lights will look like in your garden. Solar landscape lights brighten up your garden pathways, outdoor areas, and driveways in more ways than one. Plus, they come in a variety of colors, shapes, designs and even patterns so that they can match with the overall look and design of your outdoor space. Some are shaped like beautiful flowers with intricate patterns, while others look like antique pieces with their crackled glass lenses. So there really is a wide range of choices available to suit all tastes and preferences. Prior to using your new solar lights, you might have to charge them like most new appliances. For most models, all is needed is to put them in the ground and position them well so that they’re able to fully absorb the sun’s rays. The amount of time that you have to charge them for will depend on the particular brand that you’re using, and the same goes for how long they stay on for after they’re fully charged.